In third grade, everyone knows that flowers smell good. But what about blossoms? Do they smell good too? 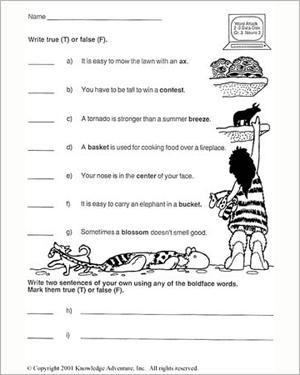 This vocabulary activity worksheet has a list of sentences, and you must decide whether each one is true or false. Only your vocabulary skills can help you here. If you’re unsure of the meaning of any of the vocabulary words in this worksheet, finish the other ‘Woolly and the Cave Kids’ worksheets first. ‘Woolly and the Cave Kids: Word Usage’ is the best place to start.